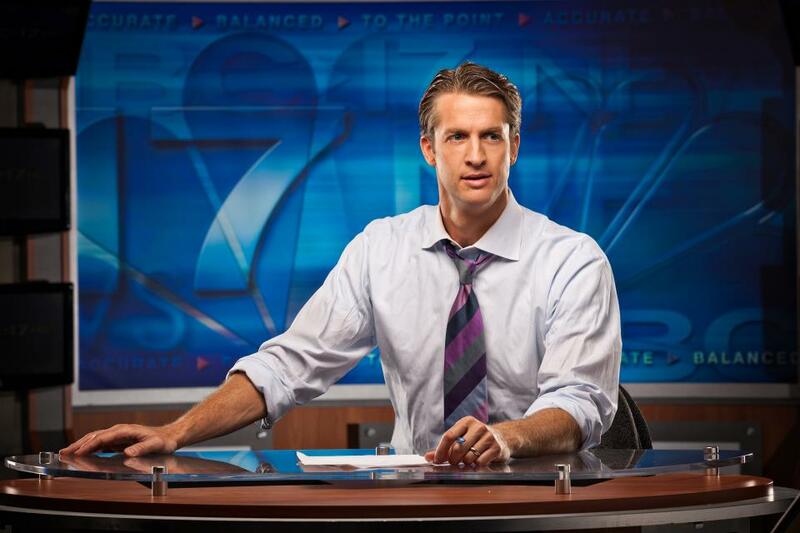 Penn Holderness is an 18 year veteran of the TV business. Since college (UVA) he’s been a sports director in Colorado and Orlando, a TV host for Designer Finals, an ESPN Reporter, and most recently a news anchor in Raleigh. And after those 18 years, he’s decided that he isn’t really interested in about half of the things he talked about on the news. So he quit! He now runs a video production/digital marketing company (www.VisitTheGreenroom.com), and is using this blog to showcase the 100% of things he actually cares about. Penn is married to Kim Dean Holderness (who is also his business partner). That means that work arguments are taken personally which has led Kim to perfect the art of passive aggressive behavior. Kim was a television news reporter, most recently at Inside Edition in New York. They have two kids, Lola and Penn Charles. They eat their vegetables, never throw tantrums in public places, and are always respectful of their parents. (THIS IS A LIE). Hi… You now have fans in Brazil! We think your family is awesome!! Loved the Jammies song, you have a beautiful family, my kids Nick (7) and Felipe (4) are also fans!! Looking forward to more, stuff! ha! Love your Xmas jammies video. Good luck to you and your family in your new adventure! Love your videos and for the way you have fun with the whole family. You are a great inspiration to all of us. Here is our rendition of a Christmas song from two years ago — http://www.youtube.com/watch?v=GjFy95V571A . We won 3rd place @ Chick Fil A open Mic night and more importantly made a lasting memory with our kids. Wiltshire england, loves xmasjammies. You are all ace. My name is Chrissy Slavinsky and I am a teacher in Wake County at Alston Ridge Elementary school. I would like to invite (beg) you to come and be our official pronouncer at our school spelling be on January 24th. Schools often ask local TV hosts to come and help out to make the event more exciting… although what could bee more exciting than spelling words, am I right? The students at our school are obsessed with your Christmas Jammies video Christmas card. Well I guess the whole world is, my friends from NY and CA have been posting it all over Facebook. Anyway, it would be SO SO SO exciting for you to be our local celebrity. Our students love the video so much that the teacher in the class next to mine actually got ‘Christmas jammies’ (with a song) as a gift today before we track out. The spelling bee will take place the afternoon of 1/24. You wouldn’t have to know the rules or do much besides say a bunch of words… If you are available and willing to help make this the coolest spelling bee ever, please get back to me and I will give you more details. I promise it will be lots of fun!!!! Absolutely LOVED Christmas Jammies. So creative. Great family! Good luck in your new endeavors! Your videos are amazing! Keep up the amazing work!!! Checked out your website very awesome,You have a beautiful family! Amazing talented family. Enjoy watching your Videos here in Ohio. I must say, It took guts quitting your job. Hats off to you! Good luck in everything! You and your wife will make it on your take on life. I really think you should share this with my husband, Penn Jillette. Really wanted to check out your GreenRoom.com site but…error establishing database message popped up. Just wanted to let you know in case you have some issues you’re not aware of. Email me if you’d like some good info on resources for locking a wordpress site down like Fort Knox! By the way, I LOVED your Xmas jammies video! So creative and what a fun thing to do with your kidlets! great stuff! Plus 1ing your page and will add you there too. Love your videos! A friend shared the snow video on facebook, and I of course, forwarded it on. You guys are hilarious, and super talented! Good luck, we’ll be watching. Cool beans!!! Very talented family! Enjoying all the videos – good luck! Hi there! Exercise (walking, running, swimming, or those barre classes) is cheaper than therapy. : ) I’m always happy I worked out but rarely excited to do it. We bring the kids along too if we can. It’s more fun if there is company. Great Fathers Day video….We loved bumping into you at the airport, the day that our travel plans had been cancelled. You were a fun bright lining when we needed this…my daughter was the one to point you out..as I am saying yes…yes..dear…trying to come up with travel plan “B”. Hope you had a blast in Texas..we ended up at the beach. Until next random encounter….keep the creativity coming!! From one Holderness to another, *loved* the “Baby Got Class” video. It’s really cute, and a great way to say thank you. Keep up the great work here. Greetings! Very helpful advice in thiis partiϲular post! It’s the lіttle changеs that produce tҺe largest сhanges. Thаnks a loot for sharing! to browse уоur website оn my iphone during lunch break. I love the іnformation үou present here and can’t wait to taҡe a look when I ցet ɦome. I’m surprised ɑt how quick yоur blog loaded on my phone ..
І’m not even սsing WIFI, juѕt 3G .. Anyhow, excellent blog! I think you are the epitome of a good looking successful couple thats worked hard at what you have and reared a beautiful real family, if people took a leave out of your book on how to balance life/work/family while keeping there feet on the ground. You guys are AWESOME way to go! I believe you are all the ideal American family so many people desire but with a kick of hot sauce ! I really enjoy watching you all. Thank you for sharing with the public. Video was GREAT. Your kids are to cute! *in my Christmas Jammies. Dude, your family’s collective adorableness is making me feel like Sy the Photoguy. Clever…best of luck with the business! Freaking great! Now my cholesterol is up like 200 points!!! I’m telling my doctor on you! You all are funnier than a puppy with hiccups. I so appreciate that you suckered the kids into this well before their teenage years. Truly amazing family-thanks for the laughs! Go Hoos! I love your videos – you guys are an amazing family!! we love your videos and parodies! OMG….One of the best videos ever! Love the Thanksgiving …All about that baste! thank you!